From delight to devastation in the stands at the Etihad for goalless draw. 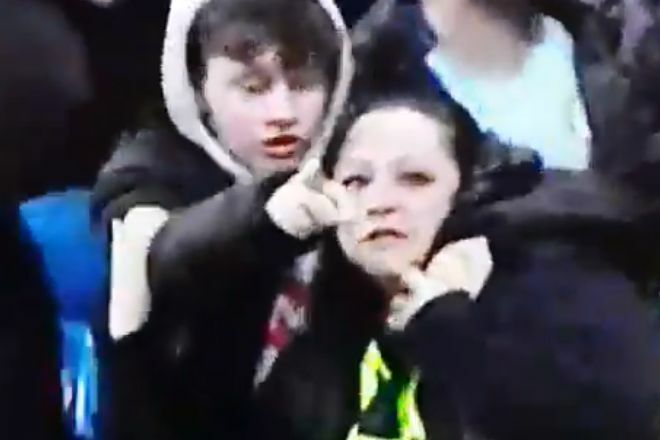 See a lady wildly celebrate a disallowed Manchester City goal in the stands at the Etihad, in added time at the end of Manchester United’s visit to the stadium on Thursday night, only to express her shock when a kindly youngster next to her points out that the assistant referee had flagged for offside. The match ended goalless but there was late drama as Marouane Fellaini was sent off for headbutting Sergio Aguero before City substitute Gabriel Jesus’s header was correctly ruled out for offside. The woman goes from delight to devastation within a few seconds in the short clip as realisation slowly dawns upon her.